OrientDB was born as a Document database. The fact that it has physical links (index-free adjacency) makes it a graph database, but still, the core API was designed as a Document API; the Graph API was added later, as a separate component, based on Apache TinkerPop 2.x standard. different object lifecycle: did you notice the doc.save()? 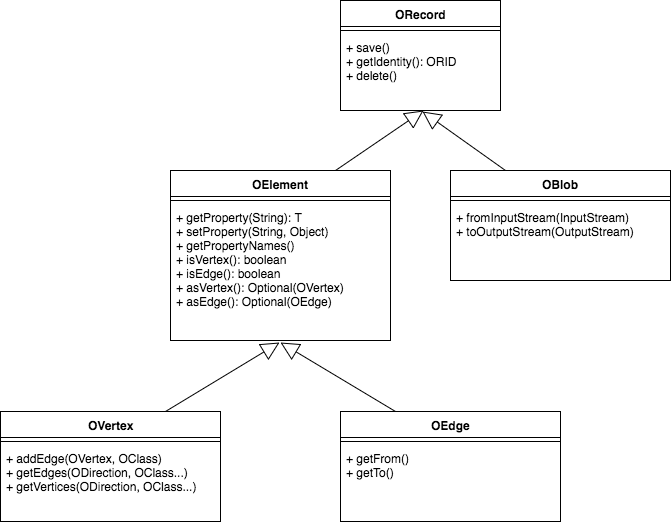 In OrientDB is a MultiModel db, so in v 3.0 we decided it was time to privide a single, unified Multi-Model API. This means that with ODatabaseDocument instances you can query documents, but also graphs, without the need for an additional API. In v.2.2 you needed the orientdb-graphdb module to perform graph queries (eg. queries that use out()/in() operators); in V 3.0 we moved all the basic graph operators to the core module, basically you don&apos;t need orientdb-graphdb anymore, unless you need explicit support for Apache TinkerPop API. V 3.0 also includes a new query interface that explicitly return elements that can be converted to the Multi-Model interface hierarchy.